With the collective goal of fostering reading at home, the Mission Promise Neighborhood held its “Third Annual Holiday Book Giveaway” on Dec. 15. The venue was Plaza Adelante, the neighborhood center of the Mission Economic Development Agency (MEDA). MEDA is the lead agency of this education initiative. Mission kids donning holiday attire — ranging from colorful sweaters to Santa hats — chose two or three books to go under their Christmas tree. The cute factor was high, as Mission Graduates’ Executive Director Eddie Kaufman played Papa Noel for the second year in a row, kids queuing up for a photo op. There were books available for all children, with brackets of 0-3 years of age, Pre-K to kinder, first to third grade, fourth to fifth grade and middle school. Choosing a book was no easy task for families, as there were 577 available. The majority of donations were via the Children’s Book Project, which for a quarter century has been bringing free books to underresourced kids. The remainder of book donations came from Mission Promise Neighborhood partner Tandem, Partners in Early Learning, plus from members of MEDA’s Young Leaders Council. With an amazing 445 books handed out in just two hours, the leftovers were put to good use, being forwarded to La Raza Community Resource Center, or Cesar Chavez and Bryant schools’ Parent Room libraries. Additionally, there were 30 Talk, Read, Sing bags doled out at a workshop promoting early literacy at home, taught by Mission Promise Neighborhood Early Learning Program Manager Ada Alvarado. Intern Maria Jose Gallo added an additional gift: Kids could be seen busily making a personalized bookmark using art supplies and crayons. She also created a two-pager advising parents that students get tested to ascertain their reading level — important to finding appropriate books to engage your child. According to the 2016 Mission Promise Neighborhood survey (see Page 30), 77 percent of parents of children zero to five years of age now report reading to their child at least three times per week. This is an increase from 64 percent in 2014. Recent research has shown that children whose parents more frequently read to them, regardless of income or education, are more likely to do well in school. The respondents by far indicated that they liked the event, offering ideas for betterment ranging from longer hours to maximize time at resource tables, augmenting donations so children could get three to five books each and finding toy donations, the latter possibly given out by raffle. Upon departure, parents received gift bags with snacks and complimentary tickets to a pair of local museums: the Asian Art Museum and the California Academy of Sciences. Thanks to partners Good Samaritan Family Resource Center, MEDA, Mission Graduates, The City and County of San Francisco Office of Workforce and Employment Development and the San Francisco Public Library for being on hand to make the holidays joyous for our Mission Promise Neighborhood families. “The book giveaway means so much to our Mission families. This is a true collaborative effort. Thanks to the nine staff that volunteered their time, plus our many partners that contributed to this community event’s success,” summed up Mission Promise Neighborhood Family Support Manager Celina Ramos-Castro. The majority of students were from pre-K to 8th grade, with families having been made aware of the day’s agenda from fliers, partner agencies or other family members. Mission Promise Neighborhood Associate Director Liz Cortez welcomed attendees, sharing her own inspiring story that showcases the importance of parents taking an active role in their child’s education. Cortez explained how her own parents lent such support, despite their being newcomers not cognizant of how to get into college in this country. Such support translated to Cortez earning her degree. Next up was a panel conversation moderated by Amelia M. Martínez-Bankhead, a Mission Graduates board member. Five parents provided information about the upcoming workshops, telling of their experiences applying for affordable housing, getting family finances in order, promoting reading at home or creating a college-going culture at home. Their words definitely resonated with the crowd for their attending following workshops; Abriendo Puertas; Literacy Champions; How to Pay for College; Family Financial Health; Overcoming English Language Barriers in Schools, Housing Lottery Readiness; and Reclassification. The latter proved popular, with Mission Graduates and Familias Liderando la Educación Exitosa (FLEE) leading education around this reclassification campaign. A survey was handed out as a way to better gauge parents’ understanding of Latino reclassification issues for English Language Learners. There were 76 surveys completed, and parents will now be invited to attend groups at Mission Promise Neighborhood schools, plus become active participants in the reclassification campaign. To keep six- to 13-year-olds engaged and learning while parents attended workshops, a trio of Mission organizations were on hand. The Mission YMCA taught STEM via intriguing science experiments. Instituto Familiar de la Raza offered drumming, the joyous sounds filling the campus’ courtyard. Project Commotion featured jump roping, with athleticism showcased by numerous youngsters. Once parents exited their workshops, it was time for the distribution of backpacks generously donated by the Mayor’s Office of Neighborhood Services (MONS). These sturdy backpacks contained everything from notebooks to coloring pens. A raffle was then held for backpacks teeming with even more much-needed items for the school year, with 10 delighted families having their numbers picked. Additionally, there were raffles for a pair of $20 gift cards from Mateo’s Taqueria, located on Mission Street. To fostering reading in the community, 280 Spanish- and English-language K-12 books were doled out by the San Francisco Public Library. Volunteers from the library also handed out Talk, Read, Sing bags for infants and toddlers. For a touch of art, MONS also divvied up complimentary museum passes to a number of San Francisco venues. To strengthen families, there were 12 resource tables offering materials and free services. Topics ranged from affordable housing and low-cost internet to after-school programs for children and literacy information. Parents walked away with information, pamphlets … and the tools they needed to succeed. By the time the five-hour Education Forum 2017 came to a close, families were definitely ready for the 2018-2019 school year. Let’s make it a great one! The Mission Promise Neighborhood acknowledges the partners, volunteers and community members that made the Education Forum 2017 a success. Thank you to Mission Graduates, MEDA, Mission Neighborhood Centers, SFUSD-Early Education Department, Tandem, Partners in Early Learning, Project Commotion, Instituto Familiar de la Raza, Mission-YMCA, La Raza Centro Legal, Good Samaritan Family Resource Center, AT&T, ScholarMatch and Innovate Public Schools. The importance of reading can never be underestimated. The staff of the Mission Promise Neighborhood always keep this fact front of mind when speaking to our families, whether at community-based organizations or in the four schools that comprise this federal education initiative. Family Success Coach Manager Amelia M. Martinéz C. and her team have been hard at work planning the event. “Our Mission Promise Neighborhood families were so appreciative of the donated books at the first holiday book giveaway last year, so I knew we had to hold another event this season. It definitely gets everyone in the holiday spirit and is a means for parents to learn how to foster their children’s reading skills,” explains Martinéz. Collaboration with partners is always needed. 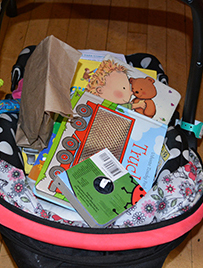 That meant donations of hundreds of books — for infants to eighth-graders — from the San Francisco Public Library and Tandem, Partners in Early Learning, the latter having a designated room to hold storytime for infants to 6-year-olds. This activity was a definite success, based on the abundance of smiles on the faces of kids … and their parents. Also joining as part of the resource fair were four partners. Good Samaritan Family Resource Center and Mission Neighborhood Centers availed parents of child care services, while the San Francisco Public Library and One Degree helped families connect to resources online and assisted those without an email to open an account. In MEDA’s Digital Opportunity Center, parents with library cards were assisted in downloading free tickets to popular neighborhood attractions, including the Exploratorium. Holiday outings will definitely be amazing this December because of this “Discover and Go” activity. To add a holiday touch, Papa Noel showed up (a.k.a. Executive Director Eddie Kaufman of Mission Graduates). Kids excitedly toting their new books took a picture with Santa. Kaufmann masterfully played his role, enthralling the youngsters. To complete the community effort, volunteers from John O’Connell High School and promotoras were on hand. Everyone’s got a long shopping list for this Thursday’s Thanksgiving meal, but for some that list cannot easily be met … if at all. The habitually underresourced sometimes cannot fit the added expense of this holiday meal into their tight budget. This is true of a number of Mission Promise Neighborhood families, with household incomes less than half that of the median of expensive San Francisco. The good news is that 57 Mission Promise Neighborhood families now have the complete meal of turkey with all the trimmings, thanks to tech company DoubleDutch. That business’ philanthrophy was coupled with a donation of 25 turkeys from the San Francisco Mayor’s Office of Neighborhood Services (MONS). “We’ve had families asking if we were going to give out turkeys this year, since Mission Promise Neighborhood has done so in the past. 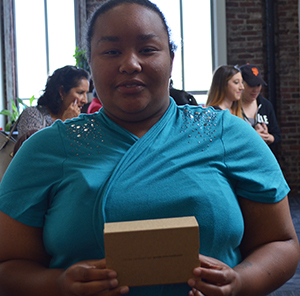 It’s great that DoubleDutch and MONS stepped up to help out and make these families’ holidays special,” explains Mission Promise Neighborhood Family Success Coach Manager Amelia M. Martinéz C.
Today’s recipients were chosen two ways. One way was via nomination by family success coaches, who work in four Mission schools – and at partner agencies — and are well aware of families most in need. Additionally, MEDA staff gave the names of clients they serve who might need assistance this holiday (MEDA is the lead agency of the Mission Promise Neighborhood education initiative.) This list included nine Mission Techies, a young adult program creating a pipeline for diversity in tech. DoubleDutch donated the money to buy the 13- to 15-pound turkeys, which Mission Promise Neighborhood then purchased. The company also asked staff to donate sides, with everything from cranberry sauce and gravy to stuffing and green beans available for families. DoubleDutch, which has a marketing platform to increase engagement at live events, also sent out two volunteers, J.J. Arnold and Claire Sands, to help with distribution of the food items. Sands even donned a turkey outfit, much to the delight of the youngsters on hand. It was greatly appreciated that these hard-working DoubleDutch employees took time out of their busy schedules. After all, DoubleDutch was recently ranked the 95th fastest-growing company in North America, on Deloitte’s 2016 Technology Fast 500 – no easy feat. DoubleDutch especially wanted to help the community this year, considering the shift in political climate. That’s why the company’s Nicole Infiesta organized today’s event. Monica stopped by so that her youngster could take a digital storytelling workshop. Jorge wanted to learn how to look for work online. Middle-schooler Jasmine wanted to create her first mobile app. These were just three of the many Mission Promise Neighborhood families that came to Everett Middle School last night for the seventh “Get Connected!” event. This jam-packed evening brought in volunteers from the tech world to teach digital literacy to the underserved Mission community. Essential sponsorship came in many levels. The event’s Platinum Sponsor was Google, Gold Sponsor was Facebook and Silver Sponsor was Everett Middle School, the latter providing funding and the venue. Community Sponsor Univision was on hand with a deejay to get the crowd going, while Hospitality Sponsor Pollo Campero stepped up to the plate and provided much-appreciated dinner for all attendees. The evening started with a resource fair, so that families could learn of all the free services in the Mission. Support for Families, La Raza Centro Legal and SF-Marin Food Bank all tabled. Comcast staff was on hand, signing up residents with packages as low as $9.95/month. That broadband company’s Internet Essentials program is available to students with free or reduced-cost lunch — or at a school where a high percentage of students are — with the 400+ students at Everett Middle School all deemed eligible. Such a connection is vital. Despite the Mission being the center of all things tech, too many Mission families are using just a smartphone for their internet connection at home. That is not enough. Families and students need a computing device with a keyboard so that a parent can look for a job online or a student can write an essay. A recent School Climate Survey done at Everett revealed that just 59 percent of these middle-schoolers have access to a desktop or laptop computer at home, while 51 percent have a tablet and 74 percent have a smartphone. One of the aims of the Mission Promise Neighborhood, the federal initiative of which Everett Middle School is a part, is to provide education on the need for high-speed internet and a computing device in the home for all Mission students. The workshops at the event helped with this education. Volunteers taught everything from basic digital literacy to internet safety to creating apps. These one-hour classes ran from 5 p.m. to 7 p.m.
After the workshops, a career panel was on hand to share their stories of getting into tech. Panelists included: Roberto Mejia from Jones.IT, based in the Mission; Claudia Hernandez from YouTube; Abraham Velazquez from DropBox; Veronica Murillo from LinkedIn; and Jim Van Tassel from Univision. Their inspiring stories showcased that there is a place at the table for everyone in the tech sector. After enjoying their chicken dinners generously donated by Pollo Campero, it was time for a raffle. Anyone who had garnered three signatures from the resource fair or workshops was eligible. There were gift cards. Tablets. Even a Chromebook. All winners grinned from ear to ear when their names were announced. The seventh “Get Connected!” event was a definite success, with the community brought together and lives bettered. Last night, hundreds gathered in the Mission Promise Neighborhood for the second community meeting on the Mission Action Plan 2020 (MAP 2020). The theme was “A Plan for and Community Discussion on Affordability, ” with the venue Buena Vista Horace Mann School on 23rd Street. A resource fair on tenants’ rights — and other issues of community importance — was part of the event presented by the City and County of San Francisco, Calle 24, the Cultural Action Network, Dolores Street Community Services, MEDA, Pacific Felt Factory and other community-based organizations. The goal of MAP 2020 is to retain the socioeconomic and cultural diversity of the Mission neighborhood by providing solutions to help protect tenants at risk of eviction, increase affordable housing, stem the loss of social and community services offered to low- to moderate-income residents, and support and retain local businesses, including employers providing working-class jobs. The aim is to keep 65 percent of the Mission as low- or middle-income residents. City officials on hand included District 9 Supervisor David Campos, Director of Mayor’s Office of Neighborhood Services Joaquin Torres and Jeff Buckley, who is senior advisor to Mayor Lee. To welcome the attendees, City Planning Director John Rahaim took to the mic, explaining how San Francisco is trying to address the needs of Mission residents by being part of these community meetings. Rahaim was followed by Director Antonio Aguilera at San Francisco Day Labor Programand Women’s Collective, who explained the need for the community’s voice to be heard. Next up was Chirag Bhakta, of the Mission SRO Collaborative, who shared data from a PowerPoint. Bhakta’s dialog was peppered with these sobering facts: there were 989 eviction notices in the Mission from 2009 to 2014, with 1,174 Latinos compelled to leave the neighborhood between 2010 to 2013. He then explained that these numbers are probably conservative, as eviction numbers do not showcase buyouts and that undocumented people may be fearful of being part of a census. Urban Planner Claudia Flores, from the San Francisco Planning Department, then continued on with the presentation. Flores spoke of the major accomplishments in the Mission community since the initial meeting one year ago. In that time, a set of community organizations and the City have been working to research and discuss the ideas collected, and implementing some immediate, short-term solutions. Increasing resources for legal representation for tenants. Expediting 100 percent affordable sites (more than 300 units). Acquiring an additional affordable site at 490 South Van Ness. Dedicating funding of $50 million for the Mission from the Prop A housing bond that voters passed last November. Implementing higher scrutiny of market-rate projects through interim controls. Launching a nonprofit and creative-space displacement program, with $4.5 million in funding. Augmenting resources for PDR enforcement and technical assistance. “We’ve already had some major victories in the past year, but there is much more to do. Mission Promise Neighborhood community input is vital to this process, so I am excited to see so many partners, city officials and neighbors here tonight,” stated MEDA’s Director of Community Real Estate Karoleen Feng. Topics for discussion tonight ranged from how to preserve existing rent-controlled housing/SROs and increase job opportunities to stemming the loss of community-serving businesses and building more 100 percent affordable-housing developments. Attendees broke into groups, in English and Spanish, to discuss these weighty topics. The clear topic of interest was affordable housing — and how it could be funded. Community Engagement Manager Dairo Romero of MEDA acted as a facilitator for the Spanish-speaking tables. The community’s valuable input will be discussed by organizations and the City, collaboratively working on solutions based on the ideas collected. The final meeting will be in June, with the date and time to be determined. Most have pored over the poetic words of one or all of these Dr. Seuss books at some point, either as a youngster or reading to their own child. Not surprising considering the numbers: 600 million copies were printed of his 60 titles during Dr. Seuss’ lifetime, with translations into 20 languages. Yet most know little about this guy with the interesting name of Dr. Seuss. Theodor Seuss Geisel was born in 1904 in Springfield, Massachusetts. He studied at Dartmouth in neighboring New Hampshire before venturing overseas to Oxford in England to continue his education. Turning avocation into vocation, Geisel worked as an illustrator and cartoonist at two renowned magazines, Vanity Fair and Life, later venturing into the ad industry. After World War II, Geisel shifted his focus to children’s books, under the moniker Dr. Seuss, with an enviable volume of stories produced until his death in 1991. Each year, the National Education Association (NEA) promotes “Read Across America Day” on March 2, the birthday of Dr. Seuss. Ms. Rose, a teacher at Cesar Chavez Elementary School, makes sure this Mission Promise Neighborhood school takes part in this nationwide event to celebrating reading. Ramos-Castro’s job is also to connect parents to resources to better their child’s reading skills. She knows of many community-based organizations – all part of the Mission Promise Neighborhood initiative – that can help. One such agency is Tandem, Partners in Early Learning. Tandem works in San Francisco, Alameda and Contra Costa counties, with a mission to “provide programs and services in high-need communities.” An example of their community impact was the successful Mission Promise Neighborhood holiday book giveaway, held at The Women’s Building in the Mission last December. Tandem was on hand to foster parents reading to their children. Other partners participated, with the Children’s Book Project donating books and the San Francisco Public Library tabling to avail families of resources. Such educational events are an essential part of the two-generation approach of the Mission Promise Neighborhood, as a means to counter impediments to family and student success. The challenge can be told via the numbers. At an early age, only 8.6 percent of 3-year-olds in the Mission Promise Neighborhood meet Desired Results Development Profile (DRDP) standards for English-language ability. Once in elementary school, 15 percent of third-grade students (compared to 48 percent in SFUSD overall) score at or above proficiency in English-language arts, while 22 percent of fifth-grade students (compared to 55 percent in SFUSD overall) score at or above proficiency in the same category. The Mission Promise Neighborhood Survey in 2014 found that 64 percent of families in the Mission are reading to their children three or more times per week. That’s something to celebrate on this “Read Across America Day,” but there is still much work to be done. To foster reading, Cesar Chavez got into the Dr. Seuss spirit today, with all grades (pre-K to fifth) taking part. To generate interest, a table was set up promoting the event. Students could be seen snapping pictures with a colorful Dr. Seuss poster located at the entrance of the school. School staff and parents – each donning a handmade, paper “Cat in the Hat” headpiece – ventured into 25 classrooms, with the volunteers reading a story for 15 minutes. All volunteers then received an NEA certificate of appreciation. Elvira Arriola epitomizes the power of the community’s involvement in today’s “Read Across America Day” event. Elvira and her two daughters live on Capp Street in the Mission, with both children having been students at Cesar Chavez Elementary School. For the last decade, Elvira has taken the time to read in the classrooms of her daughters. Elvira has made the effort to create a familial culture of reading in her household. Her youngest child is currently a second-grader, with the mother reading at home in Spanish to the bilingual youngster. Elvira’s 13-year-old turns the tables by reading to her mother in English, bettering the parent’s skills. Braving inclement weather as some much-needed rain swept through the Bay Area on Monday, scores of Mission Promise Neighborhood (MPN) families donned rain jackets and streamed into the ornate Women’s Building for some much-needed community support, in the form of books for kids. Partnering for the event were the San Francisco Public Library and Tandem, both knowing that early learning is strongly tied to long-term academic success. Tandem’s mission to “spark joy and close the opportunity gap” was clearly met, as evidenced by the smiles on families’ faces as they chose their books for holiday presents. Book offerings ran the gamut from fiction to nonfiction, historical novels to whimsical tales. Age brackets started at newborn and headed up to eighth grade. Approximately two-thirds of children each year in the United States, and 80 percent of those living below the poverty threshold, fail to develop reading proficiency by the end of the third grade. Children from low-income families hear fewer words in early childhood and know fewer words by three years of age than do children from more advantaged families. The Mission Promise Neighborhood Survey in 2014 found that 64 percent of families in the Mission are reading to their children three or more times per week. This is something to celebrate! MPN aims to ensure that the initiative’s partners continue to improve that number and get to 100 percent. Also, it is imperative to start this process as early as possible, since the MPN team knows that this is critical to brain development and vocabulary building. There were plenty of books, neatly stacked on tables and grouped for age appropriateness, for MPN families to work toward that goal. Hundreds of books, actually. With arms laden with books — and even one infant carrier serving as a shopping bag, filled to the max–departing families were also offered a gift bag teeming with goodies. This included free passes to a trio of local kids’ venues: the Asian Art Museum; the Bay Area Discovery Museum; and the Cartoon Art Museum. MPN parents left knowing there would be gifts for the holiday … and that the gift of learning would be part of their kids’ futures. While most low-income Mission families know the need for being connected, they often don’t know how to get started. This is especially true of immigrants—newcomers to this country with myriad tech options from which to choose. That’s why the goal of today’s sixth “Get Connected!” event, held at MEDA’s Plaza Adelante, was to help parents learn the best ways to keep their children safe online while optimizing the use of educational apps. For the youngsters, the goal was to whet their appetites for all things tech while creating an app in an hour. Google presented the event, with volunteers such as Hector Mujica (photo above) teaching a class called “High Seas” in a lab packed with fourth- to eight-graders. “High Seas” focuses on computer science taught in a playful, age-appropriate format. There was a Technology Career Panel on hand, explaining how they wound up in tech—sometimes via serendipity. The panel comprised: Caitlin Crump, senior data scientist at LinkedIn; Roberto Mejia, IT support engineer at Jones IT; Alberto Melgoza, financial planning and forecasting systems tech lead and solutions architect at Google; and Kamilah Taylor, senior software engineer at LinkedIn. Raffles for six laptops were held, with four elated young winners hardly able to tote the computer they were handed. Of the two adult winners, one was Carmen Ramos, excited that she now added a computing device to the low-cost internet for which she had signed up earlier in the day. There were also 10 Google Cardboard certified viewers raffled off. This innovative product offers virtual reality on your smartphone once an app is downloaded. Lunch was generously donated by Pollo Campero, with hearty plates of chicken, rice and beans served up by DoubleDutch volunteers. In addition to Google’s Presenting Sponsorship for “Get Connected,” there was additional sponsorship from LinkedIn, DoubleDutch and Microsoft. Mission Promise Neighborhood partners were on hand to avail the community of their free services. Partners included Causa Justa :: Just Cause, Good Samaritan Family Resource Center, Mission Neighborhood Centers and Support for Families. Stay tuned for details on the next “Get Connected!” event, and connect your family to tech.